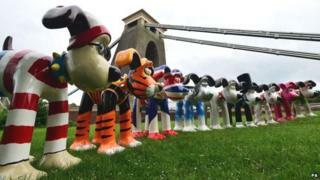 A number of giant Gromit sculptures are being removed as a popular art trail in Bristol comes to an end. Eighty statues, decorated by well-known celebrities and artists, have been dotted around the city and further afield since the end of June. Once they have all been collected they will be cleaned up and auctioned off on 3 October to raise money for charity. Three of the 5ft (1.5m) sculptures had to be repaired during the 10-week trail after being attacked by vandals. There have been similar statues at London Paddington station, Westonbirt Arboretum in Gloucestershire, Cheddar Gorge in Somerset and Hawkesbury Upton, South Gloucestershire. Designs include those from Harry Hill, Cath Kidston, One Direction's Zayn Malik, The Beano and Sir Quentin Blake. Many thousands of local people and visitors to Bristol have spent time on the public art trail visiting the colourful statues. It is expected that all the Gromits will have been removed by the end of Monday. Nicola Masters, director of The Grand Appeal said: "We have been overwhelmed by the way people from the city and further afield have taken the sculptures to their hearts." All 80 sculptures will be brought together for an exhibition from 18-22 September at the Royal West of England Academy in Clifton, Bristol.